The Lafayatte Cubic Zirconia Pear Marquise Round Vine Wreath Garland Statement Necklace is beautifully executed by its stunning design with approximately 85 carats in total carat weight! A continuous circle of a garland like design graduates down in size in an elegant fashion, exquisitely complementing your designer gown for that special occasion. A vast assortment of pear, marquise and round simulated diamond cubic zirconia are basket set to perfection in a wreath or vine like design. 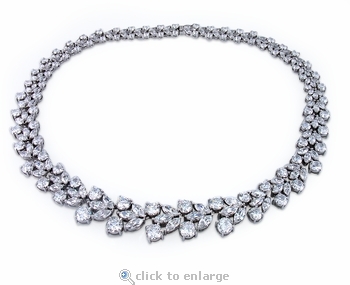 This statement necklace is featured in 16 inches and an 18 inch length is also available, in addition to custom lengths and stone colors that include man made ruby red, sapphire blue, emerald green gemstones and canary yellow, pink and diamond look cubic zirconia lab created diamonds. 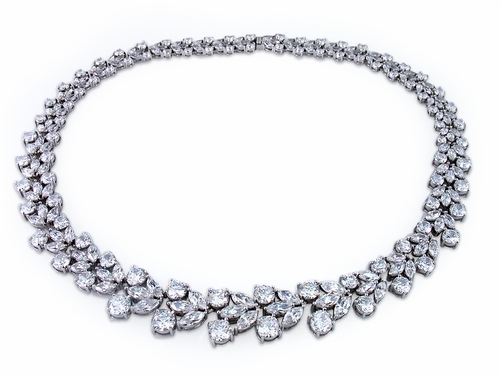 Our Russian formula cubic zirconia is hand cut and hand polished to exact diamond specifications and set in the same top quality mounting as a statement necklace made by high end jewelers to the Red Carpet Stars of Hollywood. For further assistance or customization options, please contact us directly at 1-866-942-6663 or visit us via live chat and speak with a knowledgeable representative.